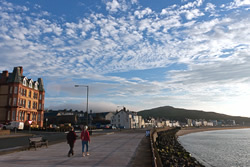 Things to do in Peel and Isle of Man The Fernleigh is well served by local amenities with the Bowling Green, tennis courts and café nearby and the swimming pool within easy reach. 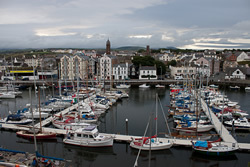 A pleasant stroll along the seafront and marina takes you to the award winning museum, The House of Mananan and Moore's smokehouse where the famous Manx kippers are made. Peel's beach is on our doorstep. With its soft sand and clean water it is one of the best beaches on the island. Take a stroll along with an ice cream in hand to get that holiday feeling. At the end of Peel beach and over the harbour bridge is Fenella beach, a small shell covered beach linking Peel Castle to Peel Hill. 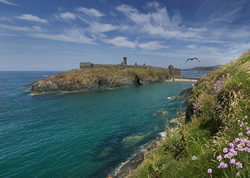 You can walk to the top of Peel and look back at the stunning scenery. In the evenings a wide variety of entertainment is on offer and there is an excellent choice of pubs, cafes and restaurants. Serving local ales, fresh seafood and providing live music performances of local talent. There are also take away options if you fancy a quiet night in. If you would prefer to pamper yourself, Peel has a few beauty and wellness establishments on offer to help you relax after a hard day sightseeing.